The National Ready Mixed Concrete Association (NRMCA) has recognized Chaney Enterprises’ Waldorf Plant with their Excellence in Safety Award for our zero incident rate in 2014. The Safety Contest is a performance and award program directed towards plants that have achieved excellent safety records and have an incident rate below the national average. The latest OSHA/Bureau of Labor Statistics Incident reports this average at a rate of 4.8 as of October, 2013. 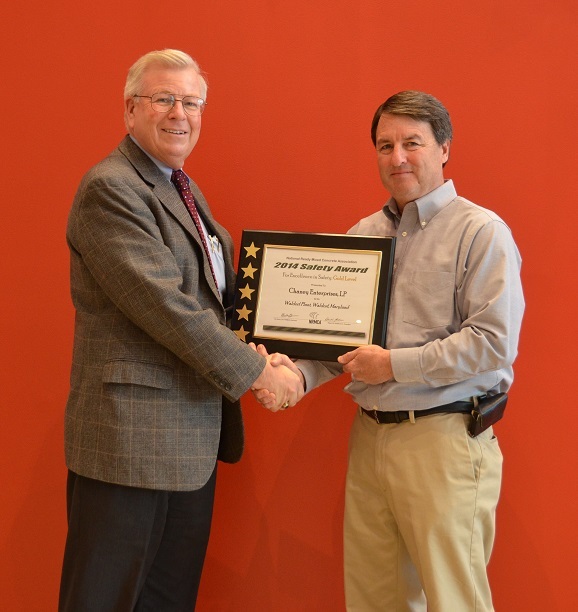 Cosponsored by Concrete Producer Magazine, Chaney received NRMCA’s most popular award at the top tier or Gold level. Over 42 million cubic yards were shipped across the nation in 2013 with an estimated 6,000 to 7,000 concrete ready mix plants in the United States. Across the Mid-Atlantic region, you’ll come to appreciate your deliveries arriving safely on time and in spec with Chaney Enterprises. Pictured below from Chaney Enterprises is William F. Childs, IV President & CEO (left) and William Mancuso, Safety Director (right).